Classes are held at the Burnside High School Dance Room on Mondays and the Riccarton High School Hall on Wednesdays. Our Monday classes are currently held in the dance room at Burnside High School. The map below shows where to find the dance room, as well as nearby parking and bus stops. By foot or bike — Burnside High School is about 2.5km from university. Head north on Ilam Rd, then turn left on Memorial Ave and right on Greers Rd. Bike stands are available near the dance room. By car — From university, head north and turn left onto Memorial Ave. Then turn right onto Greers Rd, and Burnside High School is on the left. The closest car park is shown on the map. By bus — The Orbiter, 29 and 120 all go near Burnside High School. See the map below and MetroInfo for more details. Our Wednesday classes are currently held in the hall at Riccarton High School. The map below shows where to find the hall, as well as nearby parking and bus stops. 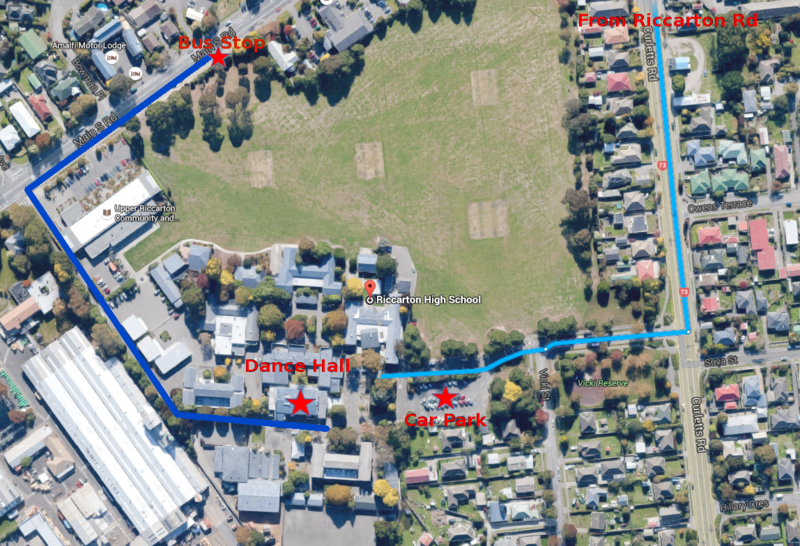 By foot or bike — Riccarton High School is about 2.1km from University. Head south on Ilam Rd, then turn right on Riccarton Road and continue past the fork, keeping to the left, then turn left on Curletts Rd, and finally right on Vicki street. By car — From University, Head south on Ilam Rd, then turn right on Riccarton Road and continue past the fork, keeping to the left, then turn left on Curletts Rd, and finally right on Vicki street. The closest car park is shown on the map, simply follow the light blue line. By bus — The Orbiter and 100 go near Riccarton High School. See the map below and MetroInfo for more details. Follow the dark blue line to reach the dance hall.